Thought I would get in touch to say how much I have enjoyed the “Memories” book and how useful I have found the website. I am a former resident of the parish but hardly know the village at all, even so I know enough about it to find my way round the book. I spent my first 5 years at Little Henham, in the red brick cottages on the bend down from the hall. 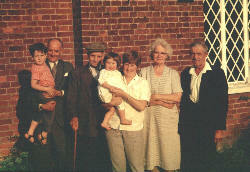 My Grandfather, Ernest Camp farmed for Mr Weir alongside Uncle Walter Cornell. In 1968 we moved to Quendon before moving to Cornwall in 1973 where I have been ever since. Having stumbled across a very distant relative a couple of years ago on the www I have in my possession the Camp family tree going back to a George Camp born in Debden sometime in the mid 1700’s. He must have moved to Chickney as his son Joshua is born there in 1785. From there my line of the family goes via Debden, Newport and Ugley before reaching Little Henham in 1929. I have not pushed to track the family back beyond George as being down in Cornwall it is not easy to spend time looking at records either kept in London or Essex. Instead I am trying to piece together a biography of my late Grandfathers life. It starts off quite eventful with a trip with the Royal Horse Artillery to the foothills of the Himalayas, catching malaria, returning to England only to fall off a cart and break his leg. He then spent the rest of his days working at Little Henham Hall for Mr Weir until he died in 1977. I am always bothering my father and uncle and aunt for info but again it is finding the right words to trigger memories. Looking through the Henham book there are lots of faces and names my father remembers (sadly he is not in any of the school photos from the 1940’s) but as far as I can make out none of the Camps featured are close family. This I will check when I can lay the family tree out in full. What you do have are two nice pictures of Uncle Walter, one driving a combine down near Pattencans, the other in the regalia of the Shepherds society. I am wondering if it would be possible to have copies of those photos? and also if you have any other photos that might feature Little Henham that you could let me have. I was very interested in the wartime memories and log books, did you know there was a searchlight up at Little Henham and the operators were camped down next door to my grandparents in the orchard. Gran who was heavily pregnant with my father would not go out in case they saw her in such a condition. Again if there are any wartime records connected with Little Henham i would love to read them. From the right…Ernest Camp (Grandfather), Mabel Camp (Grandmother), Rosie Camp (Mother), Beth Camp (in arms, Sister), Lindsay Camp (Grt. Grandfather), Unknown man with myself in his arms. On behalf of myself and my family can I thank the people who put the book together….and just one last thing. Our local family history specialist down here is related to the Nevilles of Henham….it’s a small world!